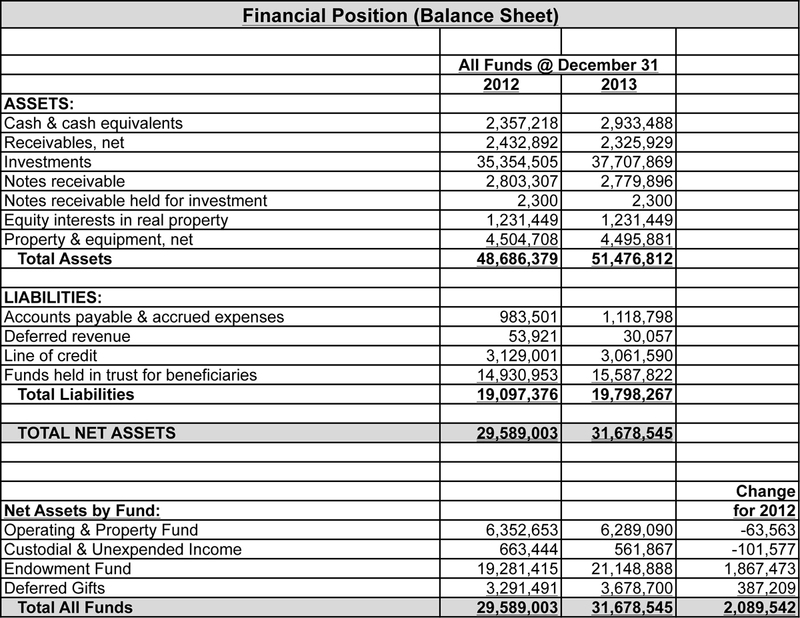 In the pages following this letter I have included a summary of the financial statements of the Diocese for the year ended December 31, 2013. 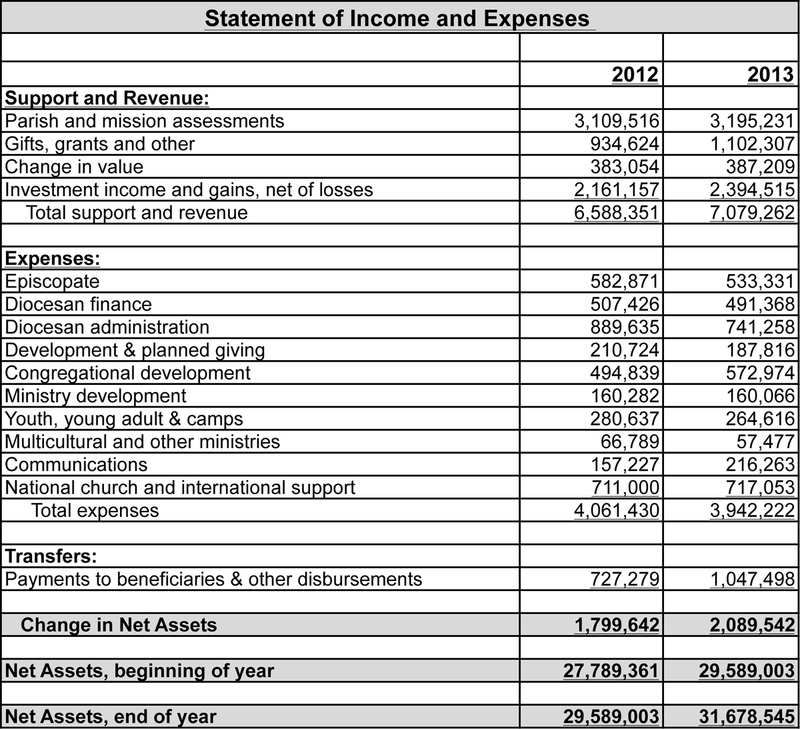 The Diocesan Corporation in total achieved an increase in total net assets of $2.1 million during 2013. This increase was almost entirely due to the growth and investment returns from the investments of the Endowment Fund. As noted in last year’s convention reports, at the beginning of 2012 the management of the endowment’s invested funds was transferred to The Investment Fund for Foundations (“TIFF”), a nonprofit investment organization that serves only foundations, endowments and other nonprofit entities. 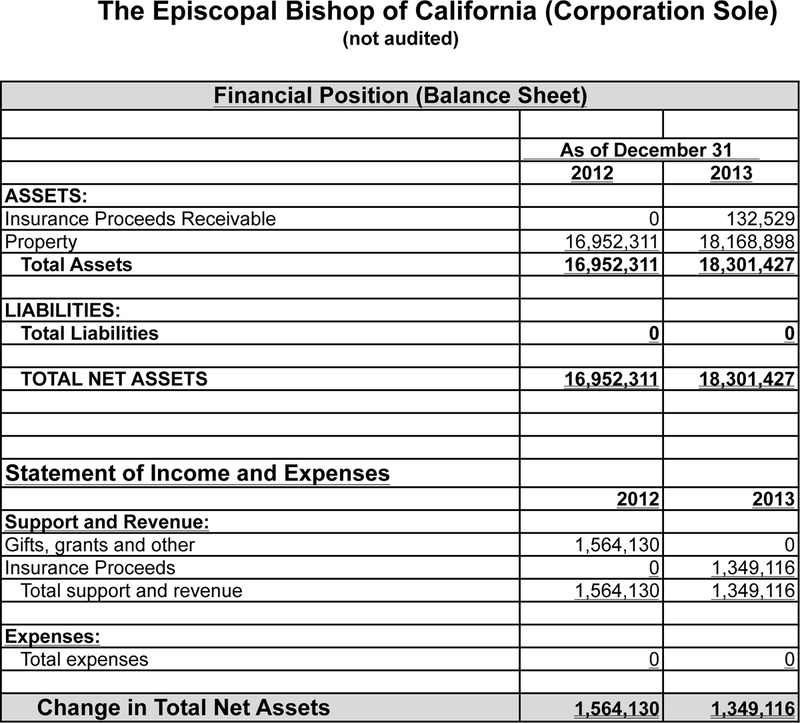 The Operating Fund of the Diocese (which reflects the operating income and expenses of the Diocese) had a small deficit for the 2013 year. The primary sources of revenue for the Operating Fund are assessment income, gifts and the annual income distribution from the Endowment Fund. 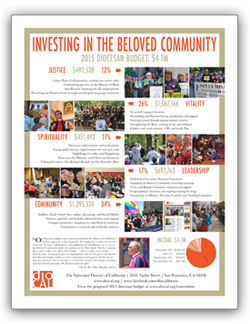 At the end of 2013 the Diocese had outstanding loans to various parishes, missions and Diocesan organizations of approximately $3.1 million under its program of providing financial assistance for Diocesan organizations seeking assistance for capital improvements to their properties. The Diocese continues to provide both payroll and personnel benefits services to related churches and organizations within the Diocese, a service that is offered in very few other Episcopal dioceses. At the end of 2013 the Diocese had receivables of approximately $1.7 million for payroll/benefit advances under this program. The Operating Fund is expected to operate at close to a break-even position in the current 2014 year, consistent with the approved 2014 operating budget. The proposed assessment rate for 2015 continues to be the lower assessment rate approved by Convention in 2011, with a top rate of 17% (versus a top rate of 20% in previous years). The Program & Budget Committee and the Executive Council have recommended a 2015 Operating Fund budget that will result in a balanced budget for the year with a small surplus. A copy of this proposed 2015 budget is included in the following pages. This budget currently reflects a cost of living increase for salaries (estimated at 3.0%) and an expected increase in the cost of medical and other personnel benefits (estimated at 10%). Thanks are due to the members of this year’s Program & Budget Committee, who worked diligently to prepare the proposed budget for the coming year. Members of this year’s committee were Roulhac Austin, Matthew Dutton-Gillett, Shelton Ensley, Joe Jennings, Clay Jones, Jim McConnell, Patricia Pearson, Tom Robertson, Mauricio Wilson, Jim Forsyth, Tom Ferguson and Bob McCaskill. The Diocese and its member churches continued to experience financial constraints over the past year as a result of the recent economic downturn. While there is an expectation that these trends will reverse in the not too distant future, it is likely that we will continue to see many of our parish churches suffer from the strain of limited financial resources. This calls for the Diocese to be particularly mindful of its fiduciary responsibilities for the financial welfare of the Diocese and all of its churches and missions. 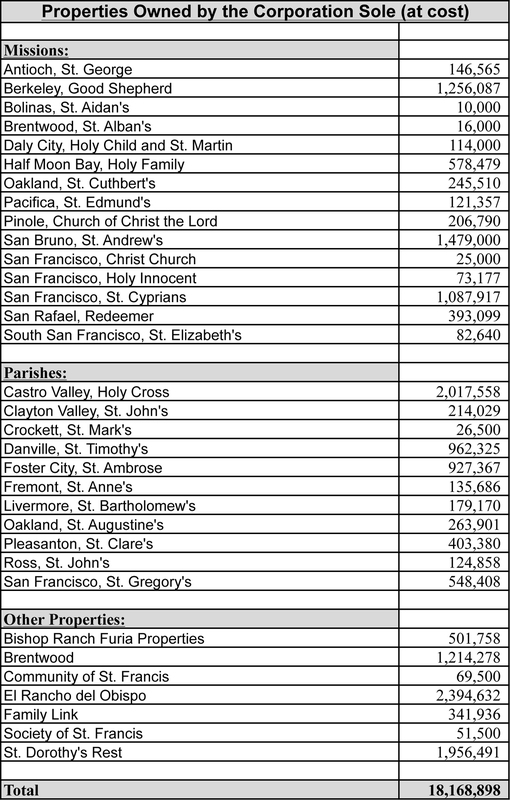 During 2013 the Corporation Sole received insurance proceeds relating to the 2012 fire damage at Good Shepherd Church in Berkeley, and is using these proceeds for the necessary rebuilding and repairs to the church. The Corporation Sole had no other income or expenses for the year. 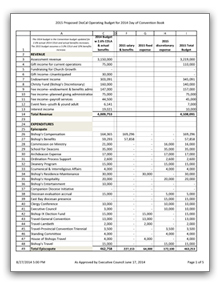 The balance sheet of the Corporation Sole as of December 31, 2013 (shown in the following pages) reflects the 33 real estate properties which continue to be held by the Corporation Sole. No parish or mission shall have an increase over 2014’s initial assessment (before appeals) of more than 50% or $17,500, whichever is less. Resolved, That effective January 1, 2015, the minimum annual compensation for clergy employed full time by the Diocese of California and by any parish or mission thereof shall be increased by 3.0% as reflected in the 2015 Mandatory Minimum Salary Schedule shown below. Resolved, That Years of Experience be defined by Credited Service with The Church Pension Fund. 1. That any deviation below the Mandatory Minimum Compensation will be permitted by the Bishop for serious cause, with the Bishop using the Personnel Practices Commission as a council of advice. 3. The Personnel Practices Committee strongly urges all churches, wherever possible, to increase the clergy and lay staff compensation 3.0% for 2014 to accommodate for inflation. 4. 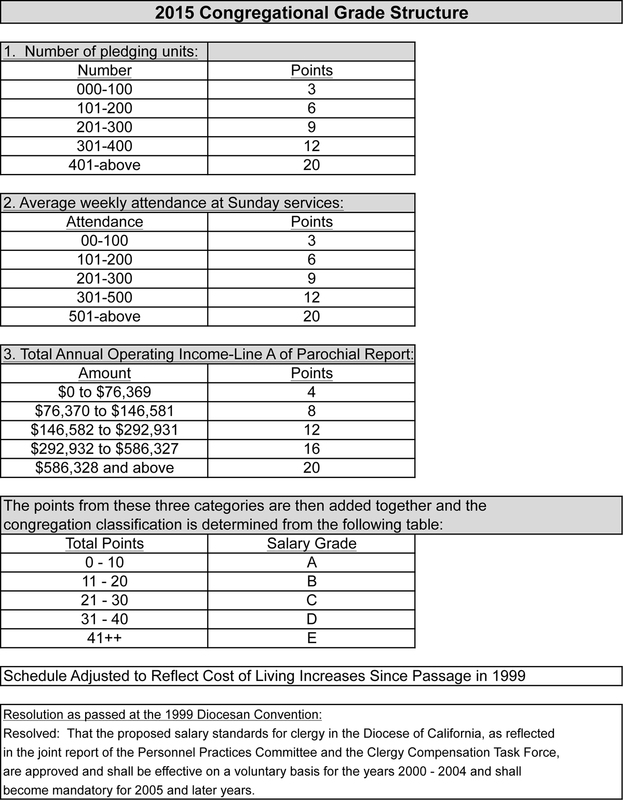 That the minimum transportation allowance be $0.56/mile for congregation-related travel and is to be adjusted in accordance with IRS published rates for 2015. 5. That associate clergy minimums are based on cleric’s Years of Service at two grade levels below actual congregation classification. Note: The compensation increase is based on the 3.0% annual increase in the Consumer Price Index for All Urban Consumers in San Francisco, Oakland and San Jose as of June 30, 2014.